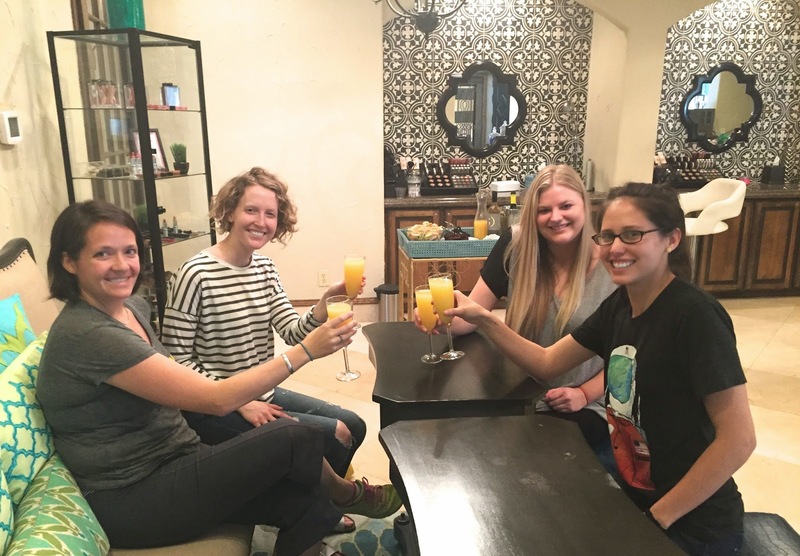 I had the privelege of hosting a spa party at SpaSocial, a full service spa, in Round Rock a few weeks ago, and I'm so excited to share my experience with you! My two neighbors and my best friend paused their busy schedules to take some time out to relax and socialize....we sure did need it. First, we were pleasantly surprised when we walked in to the huge and fabulous building. It was like stepping in to an Oasis. We felt like we had gone on vacation...kind of like when you go to a movie and forget everything outside of the theatre. That's how we felt inside SpaSocial. We brought snacks and wine/OJ for mimosas. Our hosts were amazing, and set up our snacks in a cute bar cart. They made my store bought snacks look like I had slaved over them all day. As our room was prepared, we put on our robes and relaxed. I felt like royalty sipping my mimosa in my comfy robe waiting to be pampered. Cue ridiculous photo. We then headed to our private spa party room, where we had the Wine O' Clock service which included a Mani, Pedi, and a Chair facial. Glorious! The winter has not been good to my skin, so this was the perfect timing as it starts to warm up (hello sandal weather). We did a lot of eating, sipping (lady like for drinking), and chatting. The 2 1/2 hour party flew by! Afterwards, we headed to the jacuzzi to relax and chat some more. I seriously couldn't have asked for a better afternoon. We felt pampered and relaxed, then we stepped out and were back in to the real world...haha. SpaSocial is based around a new concept of monthly memberships where members get special rates, and can use the facility any time (steam room, sauna, jacuzzi, pool). The spa parties are affordable, and totally worth the $. 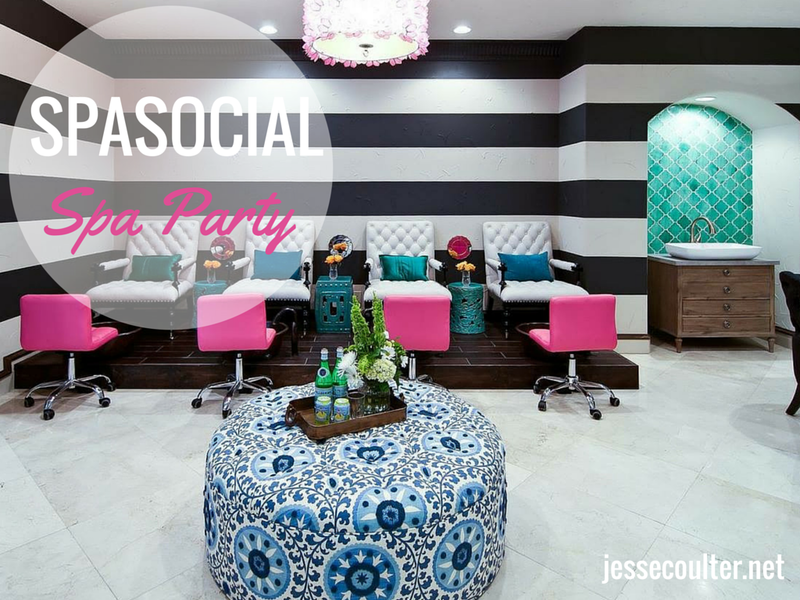 If you want more info about SpaSocial or hosting your own spa party click HERE. Check them out on Facebook and Instagram as well. Disclosure: My friends and I were invited to SpaSocial, I was not paid for this post. All thoughts and opinions are my own. Check back next week for an amazing GIVEAWAY! Oh my goodness what a blast this looks like. Pampering, friends, snacks all in a beautiful setting!!! Mimosas and a spa... heaven! I will have to check that place out!! Seriously, my neighbor was telling me about how awesome this place was a few weeks ago!!! It looks so cute inside. That is a great deal that they let you use the facilities even when you don't throw a party. Looks like you girl had a blast!!!! This space looks amazing, Jesse. Holy cow - totally luxury outside of the loud Austin scene. You must! The spa parties are the best, plus you can hang in the pool/sauna/jacuzzi all day if you want!